December 1916: Woodrow Wilson’s peace proposals are accepted by the participants in the Great War, with the guns falling silent on Christmas Day. By June 1917 peace accords are hammered out, and the most terrible war in the history of mankind drifts into history. August 1940: Seeking to restore the Russian Empire’s power, Tsar Alexei unleashes a powerful armored assault against Poland and the Baltic States. German and Austro-Hungarian forces intervene to defend the Poles. A month later, both empires are attacked by France and Italy. The Second Great War has come. Second Great War is our alternative history setting for Second World War at Sea, featuring the naval side of this war that never happened, waged by fleets that (for the most part) never were. The books use the maps and pieces from Second World War at Sea series games, and add a few of their own, to tell the story of the second struggle between the Central Powers (eventually including, once again, Turkey and Bulgaria) and the Allied Powers (eventually including, once again, Great Britain). 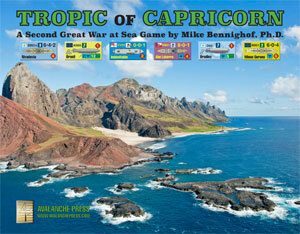 The Second Great War comes to South American waters with 24 scenarios, one full-sized map and 180 new silky-smooth, die-cut playing pieces (100 long, 80 standard). $59.99. The Second Great War come to the North Atlantic, with the ships, airships and planes of Imperial Germany, Imperial Russia and Republican France. With 740 new pieces and 30 new scenarios. $99.99. This item is not yet available. The sourcebook for the Second Great War alternative history setting, laying out the background of the participants, their armed forces and the course of this war that never happened. 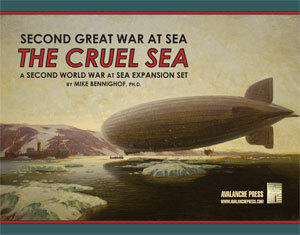 The Second Great War at Sea in Turkish waters: the Black Sea, Red Sea and Eastern Mediterranean. With Ottoman, Imperial Russian, German, Romanian, Greek and Bulgarian ships and aircraft. A companion to The Habsburg Fleet (Second Edition); Sword of the Sea also requires La Regia Marina. This book is not yet available. Austria wages naval war against France, Italy and Britain in the Mediterranean Basin. With 40 new scenarios and 180 playing pieces (100 "long" ship pieces and 80 square ones) adding the Imperial and Royal Austrian Navy plus additional ships and aircraft (including more aircraft-carrying zeppelins) for Italy, France, Britain and Montenegro. $34.99.